The script was flipped coming into Thursday’s quarterfinal match-up. The U.S. Men’s National Under-18 Team, typically the favorite to win the tournament stared at a bleak 2-0-0-2 record coming out of the prelims and was an underdog against 3-0-0-1 Sweden. While the script looked different before the game, it appeared to be the same ole, same ole once the puck dropped. The U.S. came out flying, jumped out to a 2-0 lead in the first period and never looked back. 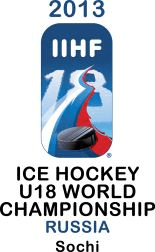 With higher stakes and a high level of familiarity between opponents, Friday night’s semifinal could be an instant U18 World Championship classic. Coming up after the jump, a look back at USA’s 4-0 win over Sweden, a quick preview of USA-Russia and a look at standout performers so far for the U.S. In Team USA’s best game of the tournament by far, Sweden was no match for what the Americans were able to do defensively. Despite going shorthanded on consecutive 5-on-3 penalty kills in the second period, the U.S. was mostly suffocating thanks to terrific defensive play and solid goaltending from Thatcher Demko. With goals from Will Butcher, Tyler Motte, Mike McCarron and J.T. Compher, the U.S. took advantage of its best scoring opportunities and played a solid all-around game to get past the Swedes. The penalty killing in the second period really could have been the difference in the game. The PK units were very aggressive and took away the points extremely well. Additionally, the U.S. killers were blocking shots and making smart reads which allowed few opportunities for Sweden. When they did get shots through, Demko was there to make the saves. Demko had his best performance of the tournament, making 28 saves and looking incredibly comfortable in doing so. His rebound control and overall poise seemed to give his team confidence. However, over the last two games, Team USA’s defense has been all-world. Steven Santini and Gage Ausmus have proven to be the shutdown pair the U.S. can throw out in any situation against any opponent’s line and they’ll have success. Butcher also has shown terrific two-way capabilities that has earned him a lot of time and faith from head coach Don Granato. It’s been a truly remarkable effort from the D corps, which was as good as it gets against Sweden. Thursday’s win was the fourth consecutive victory for Team USA over Sweden at a World Under-18 Championship, as the U.S. previously played Sweden in each of the three previous gold-medal games at the U18s. For whatever reason, it seems the Americans have Sweden’s number internationally. From this year’s World Juniors gold-medal game to the 2011 WJC bronze-medal game to the last four World Under-18s, it’s been all USA. The rematch is on. Team USA had a pretty good feeling they’d see Russia once more before the tournament was through. After that disappointing loss in the opening game in front of a boisterous crowd at the Bolshoy Ice Dome that included President Vladimir Putin, the U.S. wanted this match-up one more time. The 1995 birth years have done well against most opposing countries, but over two years at the NTDP, this U.S. group is 0-4 against Russia. That includes a loss in the World Under-17 Challenge championship game last year and three times this season. So for whatever reason, Russia has had this group’s number. However, coming out of the quarterfinal victory over Sweden, confidence is high. It won’t be easy, but if the U.S. has its best effort this time around, they’ll have a chance to knock off the tournament hosts. The big difference from this game compared to the preliminary round game is that Valeri Nichushkin, the top Russian player in the age group will be playing in the semis. He missed the preliminary game, so the tough task just got tougher. Through four games at the tournament, Nichushkin has three goals and five points. He very well could (and probably should) go within the first five picks at the NHL Draft this summer. Russia is long on skill up front, even without Nichushkin. Vladimir Tkachev leads the team with 10 points including four goals. Ivan Barbashev, who has been a great all-around forward for Russia here in Sochi, has eight points. Pavel Buchnevich has nine points and has been one of Russia’s most consistently threatening players. This is a good hockey team top to bottom. The U.S. will need its best effort of the tournament to win on Russian ice tonight. Team USA may even have to brace for some home cooking from the officials tonight. The crowd is expected to be large for Friday night’s contest, so this will be as tough an atmosphere as many of these players have played in. It should be an incredibly fun hockey game. Steven Santini — Santini may be Team USA’s most consistent and perhaps most valuable player so far. His defensive play has been a key factor in Team USA’s most recent games. He has no points, but is a plus-8 and has earned that team-leading positive rating. Santini’s an excellent skater with terrific defensive instincts. He plays physical, but more than anything else, he keeps things incredibly simple. There’s not a lot of flash and dash, just efficient defensive play. Santini leads the U.S. with an average of over 21 minutes a game. Though he hasn’t been getting the points, his puck-moving has been more than adequate. He makes smart decisions with the puck and uses his feet well to escape pressure. Santini will be a key for the U.S. tonight as he’s likely to log a ton of minutes and go head-to-head with Russia’s best forwards. Tyler Motte — Team USA’s leading goal scorer with five, Motte has done far more than just score. Motte’s relentless pursuit of the puck and tenacity when he has it on his stick has made things very difficult for opponents. He does well in possession and wins many of his battles along the boards. Motte also has been among the top penalty-killing forwards for Team USA, which has been a major positive for the Americans. When all of those elements of the game are going and he’s found his scoring touch, that makes Motte a very dangerous player. Having a forward who is able to do as much as Motte has so far is a key factor going forward. J.T. Compher — Much like Motte, Compher has been a do-everything forward for the U.S. and has been exceptional throughout the tournament. His physical, tenacious play makes him a tough opponent for any team to match up against. His seven points (3g-4a) are tied with Motte for the team lead. A lead-by-example captain, Compher has give his teammates a good guide for how to play. He blocked a shot and sprung himself on a breakaway for Team USA’s fourth goal against Sweden (which was an empty-netter). It was a symbolic play for Compher’s entire tournament. Gage Ausmus — The defensive stoutness of Ausmus has been noticeable in this tournament. He has used his physical strength extremely well defensively and has made solid decisions and reads for much of the tournament. He’s second on the team in average time on ice and offers a difficult obstacle to get around for opposing forwards. Ausmus is also doing a good job of getting the puck up ice with a good first pass. Will Butcher — Team USA’s top-scoring defenseman with four points, Butcher has shown good two-way capabilities in Sochi. Better known for the offensive elements of his game, Butcher has proven more than capable in one-on-one situations to defend effectively and has shown good awareness and presence in his own zone. Butcher is showing good decision-making ability when he has the puck and that has helped Team USA in the possession game in a big way. He’s a threat every time he’s on the ice to make something happen, which is very tough for teams to match up against. His power-play goal against Sweden ended up as the game-winner. Hudson Fasching — With five assists in the tournament, Tyler Motte gives Fasching a lot of credit for helping create many of his best scoring chances. Fasching is proving that he knows how to use his body offensively. The big 6-2, 200-plus-pound frame makes Fasching very difficult to knock off the puck and he’s shown some really remarkable touch near the net. Though he hasn’t scored a goal yet, he’s creating opportunities for his linemates and has been really effective in that regard. He’s showing flashes of why he’s still a prospect with some top-end potential. Mike McCarron — Though taking three penalties in the second period (two for shooting the puck over the glass) against Sweden were a low point for McCarron, his snipe from distance on a rush more than made up for the miscues. After taking a pass from Tyler Kelleher, McCarron used the Swedish defenseman as a screen and unleashed a quick wrister from the top of the faceoff circles. The goalie never stood a chance. McCarron’s 6-5, 225 frame jumps out, but it is his skating and soft hands that show the upside for a future everyday NHLer. His decision-making could improve overall, but the skill set has been on display in Sochi. Sean Malone — Malone has been extremely noticeable for Team USA. In fact, he was promoted to the second line and was very effective with Fasching and Motte against Sweden. Malone has some grit to him and some sneaky skill as well. He has used his strength effectively in this tournament, throwing his weight around and driving the net. He’s been sound on draws and has been around the puck a lot. Thatcher Demko — It’s important to have good goaltending in this tournament and Demko rose to the pressure of Thursday’s elimination game. He had his best performance of the tournament with 28 saves and gave his team some extra confidence playing in front of him. After the shutout, Demko’s numbers improved to 3-0-0-2, 2.01 goals-against average and .915 save percentage. He has good size and athleticism, but when he combines those with confidence in net, he’s as good as any goalie Team USA has had here in recent years. Don’t forget to tune it at noon ET Friday on FASTHockey.com for Team USA’s semifinal bout with rival Russia. Pre-game starts at about 11:45. Hope you’ll join us. This entry was posted in Junior Hockey, NCAA, NHL Draft, NTDP, U.S. National Teams, USA Hockey, World U18 Championship. Bookmark the permalink. the last deal you got? Perhaps you’re looking for an automobile now, and you’re not sure what to do differently. You’re in the same boat with many other people. Keep reading to find out information regarding what to do next time you enter a dealership.